Sustainable transport - how green is your curtainsider? Producers of full-colour curtainsides for curtainsider or tautliner trucks regularly say that using UV ink is better for the environment, repeating without question the claims of their ink suppliers who play up the odourless nature of the ink. By doing so, they are manipulating the market with this deceptive (and illegal) information. The small print in the ink safety instructions states “Causes skin and eye damage. May damage fertility or the unborn child”. As if the impact on humans doesn’t matter. UV inks are in fact more harmful to our planet and everything living on it than traditional solvent inks! 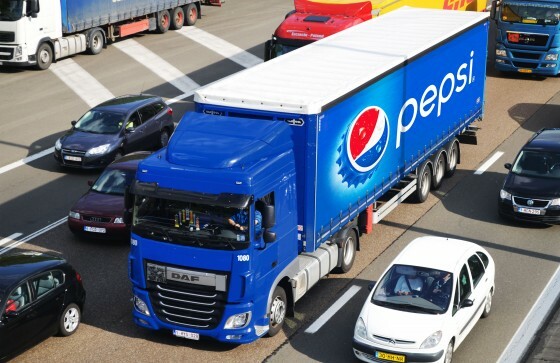 How can a full-colour curtainsider add to sustainable transport? Easy, thanks to its optimal technical sustainability qualities. But what does sustainability really mean? For one thing, sustainable means that a product has been produced or sourced in a way that puts as little strain as possible on the environment and on nature. In other words, in a way that is relatively environmentally-friendly, in particular with respect to reducing raw materials. The choice of high-quality semi-finished goods partly determines the technical lifecycle of full-colour curtainsiders. Hence the durability of the full-colour curtainsider is the biggest factor in determining sustainable transport. How do you achieve the green goal? It is essential to use solvent inks in the printing process. These inks migrate into the underlying substrate and guarantee excellent adhesion. A synthetic polyurethane coating is then applied, making the now dry ink partially viscous, without any loss of resolution. Both ink and coating now become hermetically sealed into the canvas, thus guaranteeing a bonding that will last for years. The coating preserves the colour intensity, and the non-polar characteristics of the protective clear varnish ensure years of dirt resistance, reducing cleaning frequency by half. This Solidskin process has been proved in practice and we provide a 5-year unlimited warranty. In fact, it will be at least 10 years before a Solidskin full-colour curtainsider needs replacing. This is how you too can really contribute to saving our planet’s raw materials. The introduction of Solidskin revolutionised the market for side curtains. More and more users are realising that Solidskin side curtains provide the real answer in a market where cost, durability and identity are playing an increasingly important role.